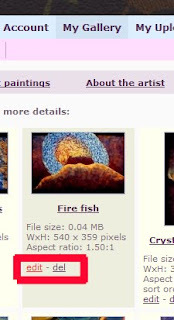 Our Artist's Gallery Program is a great way to make your art available online, and make money without hassle. All you need to do is create an account, and you can direct interested buyers to your page, where they can order prints-on-demand of your work. This is a detailed run-through of how it works. For a quick overview see the page on our site. Physical art galleries have many advantages. they are social meeting places and they allow viewers to be in the presence of the work in real life. Galleries also exist in only one place, so the work they display is only ever available to a select number of people who happen to be in the right place at the right time. Online galleries, on the other hand, have the potential to be seen by millions of people all over the world. Google's new Art Gallery Project is an example of how major art galleries are taking advantage of that very fact. The Artist Gallery Program provides local artists with an online space to display their work and sell on-demand prints. This allows artists to take advantage of our expertise in creating custom art works on canvas and fine art paper and our shipping system. Artists can sell reproductions to customers all over Canada and the USA without the time commitment and cost of printing and shipping themselves. This gives you more time to do other things, like make work! 1) Register online at Canada on Canvas. Please ensure you have entered your billing address, so we know where to send you your checks! Please note that at this point you are registering as a customer. We will create you artist account later. 2) Send us an email indicating that you want to be part of the Artist Gallery Program. Include a link to your website, if you have one, or 5 examples of your work. 3)We will send you an email once your account has been created. You can then log on to your account and upload high resolution JPGs of your artwork. 4) Once the image has been uploaded, click the "add to my gallery" button under the image. Your customers will want to know some information about you and your work. Completing your profile will give them some extra information if they are curious. All of this information can be entered under the "My Gallery" tab in your profile. You can include a Bio by in the "Gallery Settings" section. This will let people know a little more about you and the ideas and experience behind your work. In "My Gallery" you will see two words under each image you have uploaded, "edit and "del"
If you click edit, you will be taken to a page where you can enter a description of the work and keywords to help people search. clicking "del" will remove the image from the gallery. This is also the page where you adjust your pricing. Don't forget to hit "save" at the bottom of the screen when you are done! Now you get to define the price we will sell your work for. 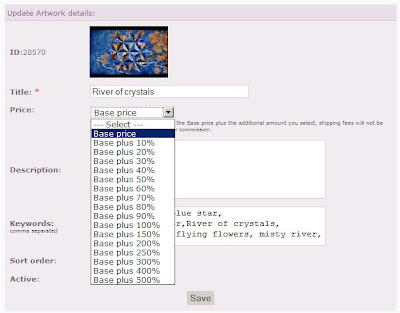 Canada On Canvas makes its money from the printing cost, so you may increase the price by adding a percent of the printing cost, all of which you will receive. We set the base price at printing plus 10%, so if you do not adjust the price you will receive ten percent of the printing cost whenever your work sells. Since we offer your customers the option of ordering your canvas prints in a variety of sizes an media, the base price is variable. This is why your commission is a percentage and not a strait dollar amount. An example might make this clearer. If you upload an image and leave the price as "base price", and someone orders a 16X20 gallery wrap, they will pay $121.00 (before taxes and shipping). You will receive $11.00. If they order a 20X30 gallery wrap, they will pay $161.70, and you will receive $14.70. If, however, you set the percentage in the drop-down menu to 30%, they the customer would see the price as $154.00 for a 16X20, and you would receive $44.00 (30+10(base commission)=40% of printing price). If your account balance reaches $100.00 in any month, we'll send your payment before the end of the following month via check or PayPal. For example, if your account balance reaches the payment threshold during August, we'll send you a payment at the end of September. if you have further questions please check our FAQ, or contact us.